Nitin Palan MBE, Chairman of Golden Tours Foundation offers his insight into the reasons behind India1914. What was the genesis of the India 1914 project? Who is involved in the project, and what led to it being conceptualised? In October 2015, it all started with a conversation between Mr Nitin Palan, Chairman of Golden Tours Foundation and Warwick Hawkins, Faith Engagement Officer of Department of Communities and Local Government who informed Nitin of the Sikh contribution to World War 1. Warwick asked Nitin why the Hindus weren’t doing anything to remember their contribution during The Great War ahead of its centenary. This conversation led Nitin into questioning why this remembrance wasn’t of the Indian contribution when the British soldiers weren’t remembered as Christians or Irish or Roman Catholic soldiers. Why then were the Indian soldiers being remembered in such a fragmented manner. Nitin met with Sqdn Ldr Rana China and Alan Jeffreys of Imperial War Museum to discuss his concern and realised that this was a shared concern of the fraternity of specialists, practitioners and curators focussing on World War 1 especially looking at the non-British contribution to The Great War. How long has it been since the project was launched? Will it continue beyond the end of the World War I Centennial in 2018? There is a need for a permanent shared remembrance exhibition and recognition within institutions and schools’ curriculum. Golden Tours Foundation is committed to ensuring that this shared remembrance is facilitated at the grassroots level across the UK. Could you tell us about the scope of the India 1914 project — is it only the website as of now, or do you have offline initiatives as well (the site does list some symposiums)? Will there be a physical aspect (small / museum/ memorial/ lectures/ books/ exhibitions) to the project as well? India1914: Remembering Indian Soldiers is a project aimed at profiling the legacy of Indian soldiers and their important contribution during WW1. The project is looking at Indian soldiers from all the various communities and regions regardless of their race or religion. This shared history is relevant as in today’s multi-faith Britain with more than a million people from these faiths have made the UK their home. The Indian contribution during WW1 was considerable, but much of the story is missing from the public domain. India provided the largest voluntary force ever assembled in history with around 1.5 million individuals. Remembering Indian Soldiers will help broaden the engagement and understanding of WW1 among these communities, as well as within the wider public sphere. We will put particular emphasis on engaging with the younger generation by providing a ‘relevancy’ framework of how their ancestor’s contribution on the world stage impacted the future paths of the two nations in terms of independence, migration and national identity. The project is unique in its very genesis and constitution. Instead of being directed by the institutions or researchers, the project’s strength has been its evolution from its many communities. The website is only one of the many vehicles of signposting, sharing and disseminating the knowledge gathered via the ‘Meeting of the Minds’ initiatives as part of this project. The project has seen several individuals discover their own personal history – these untold, unheard of and hidden stories have been brought alive via personal recollections of families of the many war heroes. Seminars, workshops, word of mouth, exhibitions, postcards, schools and community outreach are all elements of the project which have brought the remembrance of the Indian soldiers during World War 1 into center stage in the UK. Why has the contribution of soldiers in WW I been overlooked? What made the Indian soldiers who enlisted for WWI stand out from others? What made them different, or their stories worth knowing? What do you find most impressive about them? The sacrifices of the Indian soldiers was on a very different basis. They were not fighting for their Nation but there was a hope that by defending the British, they would have earned their Independence. 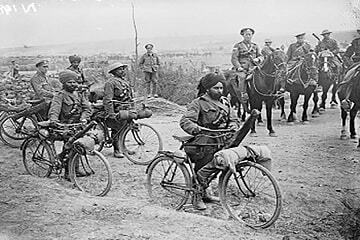 Prior to 1914, Indian soldiers had already been used by the British army for over a century not only to expand their influence over the Indian subcontinent but also across continents. As the visionary of this project, what have been your specific areas of interest to study/observe about the Indian soldiers' efforts in WWI? There is an evolving understanding of history. The more you read, the less you know. So the journey began with a simple inquisitiveness about the role that Indian soldiers played in the history of Great Britain. In the same story there are however, many hidden stories and histories waiting to be told – a task that will require many such interviews and columns to highlight. While collating the material for the project, were there any stories/personal histories you came across that particularly impressed/moved you? In one of my candid conversations with a friend, he told me of the story of a woman in a village who was a widow of a war hero and a recipient of a Victoria Cross. Someone went up to her and asked her to give them the Victoria Cross. Oblivious to the value and prestige of the VC, she out of sheer ignorance and unawareness, handed the VC to the person. My friend who shared this story is a leading solicitor in the UK, Vijay Sharma, fought this battle and got the lady the VC back. This story has moved me in more ways than one. It is this pride, this oblivion we are fighting today and giving back the due credit, respect that these War Heroes and their families so deserve. Why do you think an initiative like India 1914 is needed? How can people pitch in/help with the project, or where can they access it apart from the website? India1914 is an attempt to make history relevant for ourselves and our progeny. If we don’t think history is relevant, then who will? Today is history for tomorrow. If we do not value our history, tomorrow our children and their children may turn around and say that we were not worth remembering! India1914 has given communities across the UK realise how relevant history is to their existence. The key parameter of success of this project has been the creation of volunteers across various extractions, persuasions and professional backgrounds – from experts to practitioners to young people to museums, all have come together and interacted via this project and said just one thing – We need a shared permanent remembrance of the Indian contribution to the UK. The journey has just begun and the initiative has touched lives of many individuals, communities, schools and museums via personal outreach by individuals brought together via the project. The website is for signposting the continuous knowledge generated via the “Meeting of the Minds”. There will also be webinars, seminars, workshops, community outreach via mobile exhibitions that will help take the outcomes of this project beyond 2018. One of the elements of the project is to organise an interaction between school students and young people based in India as well as the UK and help them share their own impressions of the Indian contribution during World War. They will be interacting with experts via the Webinars. Some will also be participating in the actual documentation of oral histories of some of the stories of Indian contribution during the Great War. The project has evolved organically and will continue to grow and touch lives, making history relevant today and tomorrow.